Tigerman is the second novel by Harkaway that I have read. I loved everything about his first novel, Gone-Away World — his writing style, the characters, the story. It had all that I want In a story: tense, suspenseful action, brave and complicated characters, funny bits, clever writing, and a plot that is never predictable but is wholly satisfying. Tigerman is all those things and just as action-packed as Gone-Away World. It’s a “leet” story with a modern tone and a spectacular comic book flavour complete with superheroes, secret identities, crime fighting duos, big government baddies, impending world destruction, romance and, of course, a “david vs goliath” theme. The novel takes place on the island of Mancreu, “an unbothered ethnic jumble of Arab and African and Asian, with the inevitable mixture of Europeans”. The island is slated to be obliterated because of the catastrophic “Discharge Clouds” that erupt with a noxious gas and strange new microorganisms that cause grisly birth defects and horrifying illnesses that threaten to spread beyond Mancreu’s waters. Lester Ferris, a sergeant in the British army, is assigned to this small island, to serve as the British Counsul. Mancreu, formerly under British rule, but now in the hands of NATO, is preparing to relocate its remaining residents before its final destruction. Lester’s main job is to smooth the transition and be a support for the people still awaiting their relocation. And more importantly, stay out of the limelight. The sergeant befriends a mysterious local boy who appears to be alone in the world. The boy is clever, enigmatic and obsessed with comic books and superheroes. Lester becomes very attached to this boy and imagines adopting him and saving him from disappearing into the “system” after the relocation. Lester is suddenly thrown into a wild and dangerous scenario when a group of thugs burst into a local bar, murder their friend, Shola and narrowly miss killing the boy as they sit drinking tea. The sergeant agrees to the boy’s plea to find out who masterminded the fatal crime. This begins the wild, crazy, and perilous quest of the superhero, Tigerman. The fast action, daring acts of heroism and bravado carry us through a tale that is thick with subterfuge, complications, danger — richocheting bullets, massive explosions, wild car chases, sinister characters, an awkward budding romance, as well as a plot twist that you won’t see coming. Nick Harkaway tells a story that is witty, well-crafted filled with dark undercurrents, comedic moments, a breath of sentimentality all wrapped up in a heart-stopping, full scale adventure. I was browsing through my book lists on Good Reads looking for a “good read” — ok, ok, I can HEAR your groans! It was a tough decision as there are countless intriguing titles on my Want to Read list. While I was trying to decide, I took a casual look at books I have previously read and I came across this review for “The Remains of the Day.” This was a book I enjoyed immensely when I read it a year ago and I am sharing my Goodreads review here. Kazuo Ishiguro’s The Remains of the Day is an eloquent and moving novel. His writing style is easy and comfortable, and his story imparts a deep range of emotions — both joyful and sad — I fell into the book immediately and hated to be called back from Darlington Hall to my own living room. I was so sad when I finished reading the very last word, sad that the story was ended. This book is the narrative of Stevens,a stoic English butler, whose one aim in life is to be the best butler he can possibly be, to attain the highest level of service, to have “dignity” above all else. In the opening of the book, he embarks upon a journey in the countryside of England, ostensibly to renew a friendship with a former coworker, with hopes that he can convince her to return to the manor where they once worked together. As the story unfolds, the reader learns a lot about Stevens from his memories and meandering thoughts as he travels through small villages towards his destination. The entire novel is written as if the reader is hearing Stevens’ own thoughts and seeing his own impressions, witnessing the vignettes of the past that have led him to this sojourn. At times, I wanted to reach out and shake him, make him break out of his stoicism…give in to his emotions. Stevens’ reminiscences are sometimes laugh-out-loud funny and at times, achingly sad. His motoring holiday turns out to be an unexpected journey of self-discovery and we, as readers, are an intimate part of that journey. Ishiguro is a master at capturing all the nuances and complexities of the human psyche. There is one specific moment in the book that, for me, was so completely overwhelming — almost unbearably poignant, that it will forever be etched in my heart. The Remains of the Day is, quite simply, a beautifully written book. Have you read it? What did you think? Watch Kazuo Ishiguro talk about The Remains of the Day and Never Let Me Go. It’s been so long since I wrote on the blog — I don’t have an excuse, just laziness, I guess! Hope you enjoy this following book review that I composed on my Good Reads page and am shamelessly reposting it here! That counts as a blog post, right? I really enjoyed this book — and not just because it is a science fiction tale. I loved the way the author built up suspense, it had me dying to find out what had happened on the Robinette’s prospecting voyage. It definitely was not predictable in any sense. I was pulled along by the novel, learning more and more with every page turned, until the story had fully unfolded. 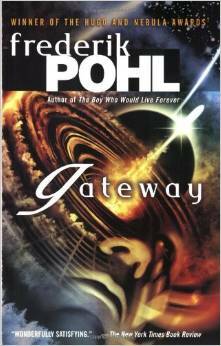 Frederik Pohl set his story on a planet, Gateway, owned by the “Corporation”, a conglomerate of sorts, comprised of different planetary governments. Gateway was long ago abandoned by the Heechee, an alien race with an intellect far more advanced than Earthlings that had for reasons unknown left a fleet of spaceships and other treasure behind. Through trial and error, humans painstakingly learned how to use some of the Heechee artifacts for mankind’s benefit, including a way to man the spacecraft in order to search the galaxy for more technology. Robinette, the main character,tells the story through the memories he replays in his head and the ones he relates to his therapist, Sigmund Freud, a sophisticated robot. Pohl, artfully fills in the story piece by piece, building the tension, until with, Robinette’s final revelation, we learn of the tragic way he got his big score. The author’s description of Gateway, the condition of Earth and its solar system, and the technology of this world, all feels very real, and even though, the book was published in 1977, does not seem outdated. Instead, it all seems authentic, plausible and close at hand. I found this novel to be an easy read, very enjoyable with enough humour to defuse the tension at exactly the right moments. I would recommend this book to anyone who loves science fiction. I was looking forward to reading The Hypnotist, there was a lot of buzz around this book and I am always on the look out for a good detective story with a strong and engaging master sleuth. Since The Hypnotist was a best-seller and Lars Kepler was touted as the next Stieg Larsson, I eagerly took it off my “Kobo shelf” and started in. Unfortunately, I found this novel to be a big disappointment. The story itself has far too many plot lines that tenuously hinge together through the past and present actions of the main character, the well-known but disgraced clinical hypnotist, Erik Maria Bark. The scenes in the story are dark and violent examples of mental illness and abuse in the extreme, but without any solid follow through the many storylines are just instances of gratuitous brutality serving to shock the readers. The plot jumps from murder to murder in a wild, chaotic frenzy with a very tenuous thread to link them to the story and none of them have a satisfying conclusion. A long (over 100 pages! ), 10 year old flashback, haphazardly inserted in the middle, bogs down the narrative, and while providing a little background for the main storyline, leaves the reader with a lot of questions that are never addressed in the book. The characters are flat, wooden and unlikeable for the most part. They are all psychologically damaged, some more than others, but their stories are not explored or explained. I had little investment in any of them as there was no character development and therefore no way to engage with or understand them. The main character, Erik Maria Bark, the hypnotist, stumbles along in life, popping pills to cope with the increasing tension in his marriage and even when faced with the possibility of losing his son, is incapable of showing any strength of character one would expect in his situation. Erik’s wife, Simone, is a wretched, whiny, self-absorbed woman who, devastated by her son’s kidnapping, fails to use any intelligence in reconstructing the events of the crime and fails to communicate the most crucial information to the police or to her husband. The police detective, Joona Linna, has a minimal role in the novel and lacks the charisma, quick wit and razor-sharp sleuthing skills that I have come to expect in any mystery or action book I read. I did not find the lesser characters anymore compelling, while their stories may have been interesting, the author(s) chose to leave the details and nuances of their lives to the imagination, thus they remained cardboard-like players in this tale. Overall, I did not enjoy this book. I was frustrated, annoyed and a little bored throughout the story. I did not feel that the plot was compelling and I had no empathy for the characters. I would not recommend this novel.